A GHBA membership opens doors for your company. What are you waiting for? How do I choose a member category? I'm not a builder or remodeler, why should I join? The GHBA works hard to provide resources for residential builders, remodelers, developers, vendors and trades. These resources include over 100 industry-specific annual education and certification opportunities, the monitoring of legislative policy regulations, affordable insurance, a 401(k) program, 16 councils, committees and divisions to be a part of and over 200 networking opportunities per year. Each of these offers a chance to make connections and grow your business. The GHBA is designed to help all companies involved in residential construction to better contend with industry challenges through collective action. We believe in building a strong and profitable building industry for Houston members and customers. As a part of Houston’s building industry, we trust that you are also concerned with the same basic business objectives that confront our industry. What about my employees? Do they each need a membership? No. When a company joins the GHBA, the entire company is considered a member of the association. We encourage all employees to get involved – this is the best way to get the most from your GHBA membership. When a company joins the GHBA, only the main contact is listed on the website and in the printed directory. Employees can also be listed by joining the GHBA as Affiliate Members. The Affiliate Membership is available to employees of companies that are members of the GHBA. This membership includes a listing on the GHBA website and in the GHBA annual printed Membership Directory. The Affiliate membership also includes a subscription to Houston Builder magazine along with a 100-word profile in the magazine and on the GHBA website. Your company must be an active member of the GHBA to qualify for the Affiliate membership. Can I use the GHBA logo? Yes! Let the whole world know you’re a GHBA member! All CURRENT association members are encouraged to use the official GHBA logo in their marketing materials. Joining the association shows that your company is committed to professionalism and the highest level of customer service. So go ahead, flaunt your membership! How do I join a specific council or committee? Your company can join the Remodelers Council for $110 or the Custom Builder Council for $100 annually. Once you’re a member of these councils, you can sponsor their events and have the opportunity to serve on their committees and boards. An individual can join the Sales & Marketing Council for $100 annually. There is no charge to join a committee or division and almost all meetings and events are open to all GHBA members. We encourage you to attend events and stay actively involved. Email the GHBA Membership Department or call 281-970-8970, ext. 110 to find out how and where to get plugged in! What are the perks of membership? Member benefits are abundant! From political advocacy and a top-notch education program to 200 networking events, member discounts and a comprehensive builder contract package, GHBA has a lot to offer. Working at the local, state and federal levels, GHBA and our federation work hard to keep onerous regulations and legislation at bay. From elections to major policy changes, your Government Affairs Department keeps a close watch on all the issues that impact your ability to earn a living. The GHBA’s nationally recognized Education Department endeavors to deliver the highest quality of education, training and professional development to our members and the residential construction industry. The GHBA offers more than 100 affordable, informative, industry-specific courses and 12 different professional designations, all certified by the National Association of Home Builders. When the competition is fierce, expertise sets the leaders apart. GHBA hosts over 200 events annually. These events range from committee luncheons and after-hour networking events to golf tournaments, cook-off competitions and black-tie awards programs. The GHBA has 16 councils, committees and divisions in which to participate, and offers hundreds of sponsorship opportunities and targeted advertising options through our various publications, the weekly e-Newsletter and the GHBA website. From our 401(k) program, comprehensive business and health insurance, to shipping and automobile discounts – GHBA members have access to some really good deals! To maximize your membership, the association offers money-saving discounts from GM, Lowes, FedEx, Dell, Budget, Hertz and Avis Car Rental, HP, Office Depot, Wyndham Hotel Group, FTD, Omaha Steaks, and more! My membership lapsed? How do I reinstate my company's membership? Once your membership becomes inactive, you cannot renew online. Please email the GHBA Membership Department for assistance or call 281-970-8970, ext. 110. 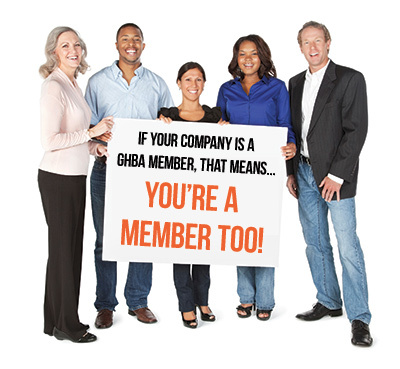 If your membership has been inactive for more than 90 days, your company will re-join the GHBA as a new member. You can either apply online or contact the GHBA Membership Department. If I join GHBA, will I be a member of TAB and NAHB too? Yes! Membership with the GHBA automatically grants you membership on three levels: local, state and national. This benefit brings members the best of all worlds – local networking and resources, along with access to invaluable state and national information and privileges. I'm not a member. Can I still attend events or advertise in the magazine? We invite you to come check us out! Non-members may attend ONE event prior to joining and we encourage you to do so. Visit GHBA’s calendar of events to see what’s coming up. Non-members may advertise in GHBA’s magazine, Houston Builder, and in the GHBA Membership Directory. However, there is a significant advertising discount offered to members, which typically saves you more than the cost of a membership. What types of companies are GHBA members? Membership in the GHBA is available to builders, remodelers, multi-family builders, land developers and all companies that provides goods, services and labor to the home building industry (classified as associates). The association exists to promote and protect the interests of the home building industry. In 2016, the 25,000 homes built in the Houston Metro area generated over $7.4 Billion into the local economy and created 83,577 jobs. Every 100 homes constructed in the Houston Metro area will generate over $29.5 million annually and more than 300 jobs. By joining the GHBA, you’ve made a significant investment in both the building industry and your own business. Now that you are a member of the GHBA, we invite you to stay actively involved in the association events and activities. The GHBA has 16 councils, committee and divisions to be involved with and hosts over 200 networking events annually. If you are not sure where to start, email the GHBA Membership Department or call 281-970-8970, ext. 110 to find out how and where to get plugged in! Will I be listed in the directory? The GHBA compiles the member list for the membership directory in October for the following year’s directory. If you are an active GHBA member on or before October 1st each year, you will be in the printed membership directory for the following year. We encourage all GHBA members to check their contact information throughout the year to ensure that the GHBA has the most current information for you and your company. What's my login and password? When you join the GHBA, you will receive your login information in your welcome email and mailed packet. If you do not have your login information, you can request it through the GHBA website or contact the GHBA Membership Department at 281-970-8970, ext. 111. How can I get additional exposure for my company? You have numerous opportunities to add value to your membership, build relationships, and generate recognition for your company in front of your industry peers. The GHBA offers many targeted advertising options, from our member website which receives nearly 10,000 visits each month, the weekly e-Newsletter that keeps members up-to-the-minute on industry news and reaches more than 4,500 potential customers each week, to advertising in the monthly Houston Builder magazine. Consider a GHBA Partnership, and you can receive tons of free perks—like print and online advertising, GHBA room rentals, and member mailing lists—at no additional cost. For complete details on becoming a GHBA Partner, take a look at the GHBA Marketing Guide or contact any GHBA staff member. Can’t commit to a GHBA Partnership? That’s okay! We just want to see your smiling faces at GHBA events, committee meetings and educational courses. Please take full advantage of the many options GHBA offers to help you expand your business and your network. You have literally hundreds of options. Most of these are low cost, but pay out big-time in professional development and expanded industry connections. How do I submit my free New Member Profile for the magazine and website? 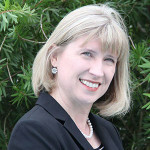 Send your free 100-word profile to the Director of Membership, Cynthia Fagan. Don’t forget to include your company contact information and logo! The Greater Houston Builders Association has more than 1,700 member firms. And every employee of those companies is a member of GHBA. Yes, that means you! As a member, you have full access to all the resources offered by the association. GHBA is here to help ADVANCE & STRENGTHEN your career. Your foundation is set. Now start building you! See what opportunities are available for you!